ADX+MACD Strategy - Find the best FOREX Brokers, FOREX Bonuses, FOREX Signals, FOREX News, FOREX Rates and everything FOREX related on Forex Directory! 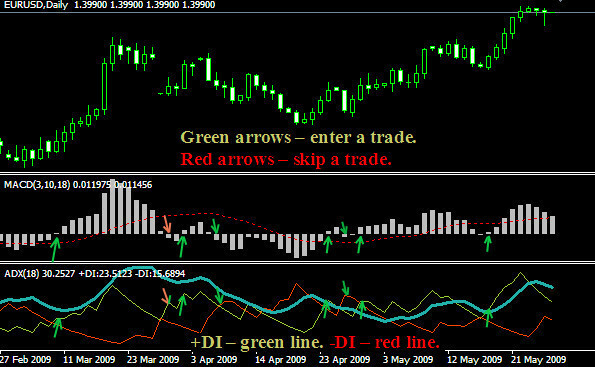 This trading strategy is using the MACD and ADX indicator (MACD(3,10,18), ADX(18) with DI- & DI+ lines). MACD is one of the best indicators and it is very useful to search for divergence or continuation of the trend. MACD will give you the signals for buy or short trades. The ADX can be uses to confirm this signal. In the picture you can see when to buy or sell. If the MACD gives a buy signal we can confirm this signal with the ADX. When +di is above -di we can confirm that we will have an upward movement. If +di is not above -di but MACD gives a signal for buy we should ignore this signal until +di is above -di. Then we can be sure that we can make a buy order. If the MACD gives a sell signal but -di is not above +di we have to ignore this signal. It is very important -di to be above +di to confirm that the price will drop in the future. You can use trailing stops to exit the trade. This will give you a chance to make bigger profits because the trend is always your friend. The money management is very important for this trading system.